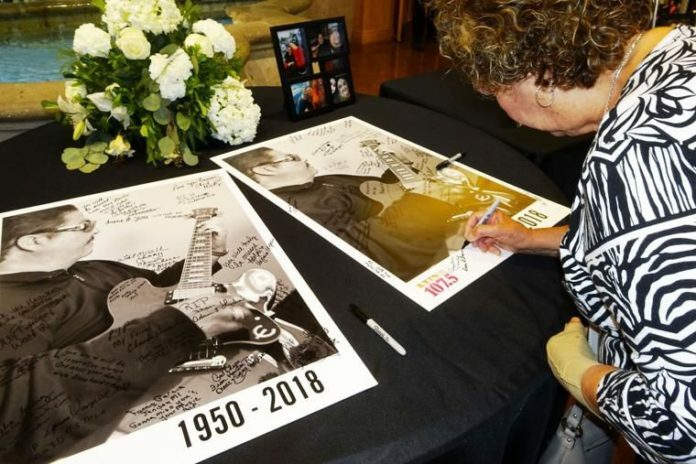 Fans and family of the late tejano frontman Jimmy Gonzalez of the group Mazz sign their names on posters of Jimmy playing his guitar during a public visitation at the Brownsville Event Center Monday. There are some sweet sounds coming down from heaven. “There’s quite a band up there right now,” said Tommy Gonzalez, brother to the late Tejano legend Jimmy Gonzalez, 67, a Brownsville native, who died last week in San Antonio. Jimmy Gonzalez of Jimmy Gonzalez y Grupo Mazz was a Grammy Award-winning musician who had several record hits, not only with Grupo Mazz but also with Joe Lopez y El Grupo Mazz. He died of cardiac arrest after becoming ill with low blood sugar issues following a concert and was transported to Methodist Hospital in San Antonio where he passed away. On Monday, at the Brownsville Events Center, friends and family of the late Tejano artist gathered to celebrate the life of their loved one as fans filtered in and out to pay their respects. “It’s very hard. You know, people talk about celebrating, yes, we want to celebrate his music, but it’s very hard because we have a lot of memories, we have a lot of memories,” Tommy said, tearing up. But Jimmy’s legacy is not lost on his family or on his friends and family all across the country. However, in the days leading up to Jimmy’s death, Tommy said it was evident his brother’s health was deteriorating. “I saw that during these last few days his health was not going up and I said, ‘Brother, you got to maybe stop, and he said ‘If I stop, this is what fuels me, this is what gives me life. If you take me away from the stage, I’m dead,’” Tommy said, recalling the conversation. While Jimmy was not in his native Brownsville for the end of his life, Tommy said he did die in a city beloved by the musician. The funeral Mass is scheduled for 10 a.m. on Tuesday at St. Mary’s Catholic Church in Brownsville. The late Tejano superstar will then be laid to rest in Buena Vista Burial Park.